I have certain things I love to photograph–they just appeal to me for some reason. I have mentioned before that I love photographing fence lines. 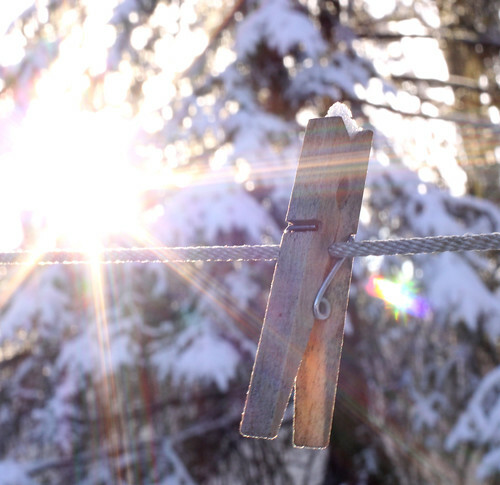 I also love photographing clothes pins. Those little clips suspended in the air have limitless possibilities for a photographer in her backyard. Yesterday I was in the backyard finding treasures to photograph after we were blanketed with fresh snow. I decided to work on nailing a flare shot for Kristin’s group, Flare Fridays. I took a few flare shots and then went back to my favorite–bokeh and dof. When I walked inside and uploaded I found……well, you can see for yourself. I thought it was perfect for Love Thursday. I love this photo. I love hanging my clothes on the line and the ritual of it. Happy Love Thursday. oh yes I am a clothes pin lady too. Your image is a celebration of light and the mighty pin ~ super! Ah, nice! Happy love Thursday! I love it! Kind of a bittersweet farewell to summer. Awesome photograph and great flare!! oh, thanks for the eye candy.